Tucked away in a protected part of the southern California coastline is pretty La Jolla, a small city near San Diego that’s got all the glam but not as many of the crowds. This spot is hands-down one of my favorite places to spend a relaxing day enjoying the beach. Some people think the name comes from a misspelling of the Spanish word for jewel, joya. Whether that’s true or not is up for some serious debate, but either way, La Jolla really is a little jewel on the coast. Here’s my quick guide to chilling out, in La Jolla, California – Golden State-style. 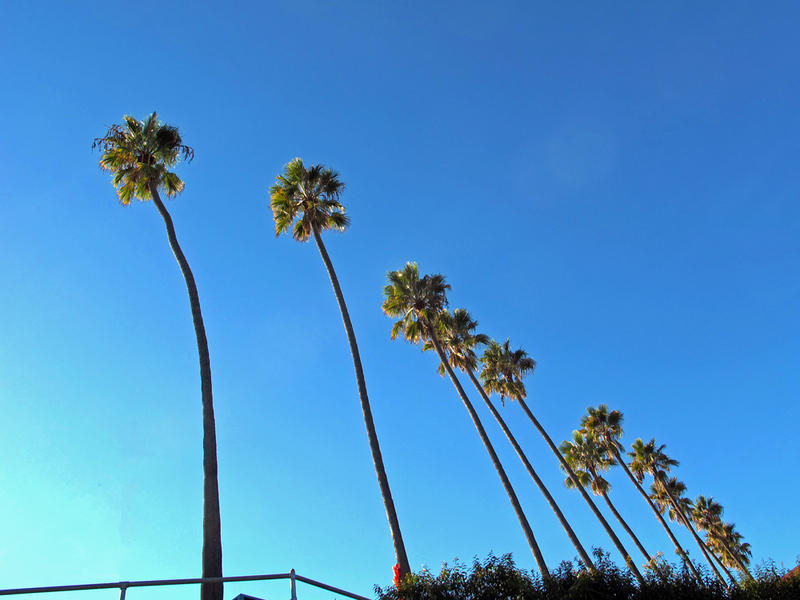 Pro tip: don’t call it Cali-style – nobody from the Golden State actually refers to it as Cali. Check out the sea caves. La Jolla has some incredible small sea caves you can go and explore, provided you’ve got a decent sense of balance and no qualms about getting wet. You can walk down and wander into lots, or you can go to the Shell Shop and pay a small price ($3 – $5) to get to go down into the caves. 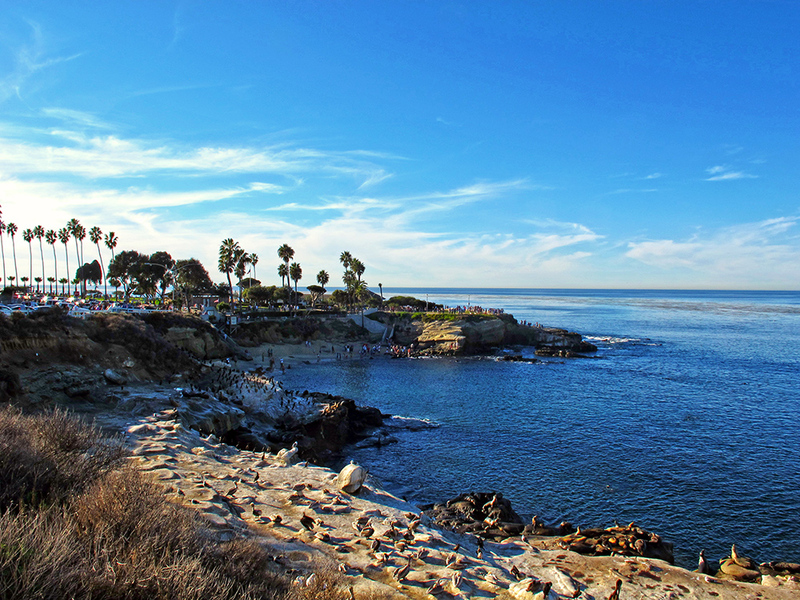 La Jolla is a little more protected than other parts of the California coastline, so that means that the Pacific’s chilly waters don’t seem to get quite as cold here. The waves are also gentler, making it one of my favorite places to go swimming. It’s also a hotspot for water sports. You can try your hand at kayaking, with lots of courses available. If you get lucky with the waves and the tides, you can kayak into the sea caves. And if you really don’t fancy getting into the water, at the park beside the beach there are tons of people enjoying the grass to play all kinds of sports, including stuff like slacklining. Make friends with a California sea lion. OK, I don’t recommend getting super close and personal with these guys – they’re enormous and could probably do some serious damage. While they don’t seem to mind people too much, I would not want to get a bite from these pointy teeth, perfect for spearing fish. Plus, I don’t think they really want you to get too close either! But do check them out from afar. You’ll probably hear the sea lions before you see them, because they love to bark up a storm as they chill with the pelicans and cormorants in the sun by the waterfront. I managed to snap this guy having a little siesta in the shade on a sheltered part of the beach, although I’m not sure how happy he was after a group of 20 people also whipped out their cameras to snag a shot! He barked at them a couple times when they got too close. Be nice to the wildlife! If you like driving, there’s a special scenic route that gives you amazing views of the San Diego coast from high up above. Even though driving and road trips definitely aren’t my thing, I have to admit that this is pretty cool. Bonus points for wearing California-cool sunglasses and driving a convertible. Or, if you’re really fancy, having your driver take you in a limousine. 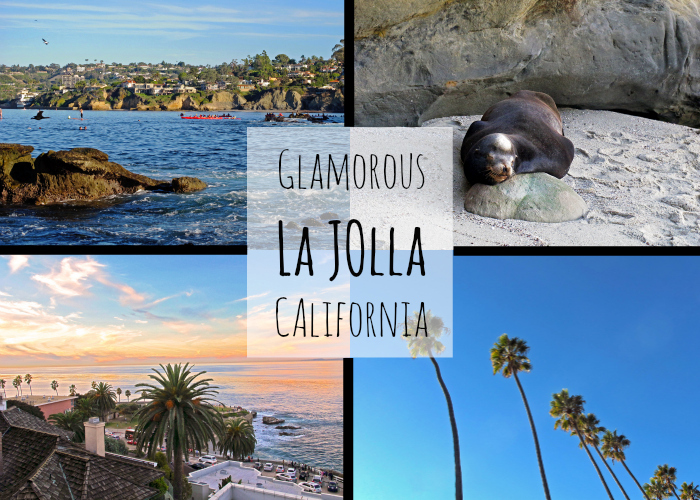 La Jolla has gotten a lot more upscale since my first visit there as a kid, and while that’s bad for your wallet it’s very good for travelers who are looking for a glamorous day out. I recommend the ocean view terrace at George’s at the Cove. The dinner menu can get a little pricey for a budget traveler, with entrees hitting $20+, but the lunch menu is surprisingly affordable. Word to the wise – it gets busy, so you may want to make a reservation if you want to sit on the open-air terrace. If not, a few of the tables at the downstairs restaurant are placed in a section with an open front, so you can get unobstructed views of the pretty cove. What’s your favorite ocean side city? Any other tips for visiting La Jolla, San Diego, or Southern California? 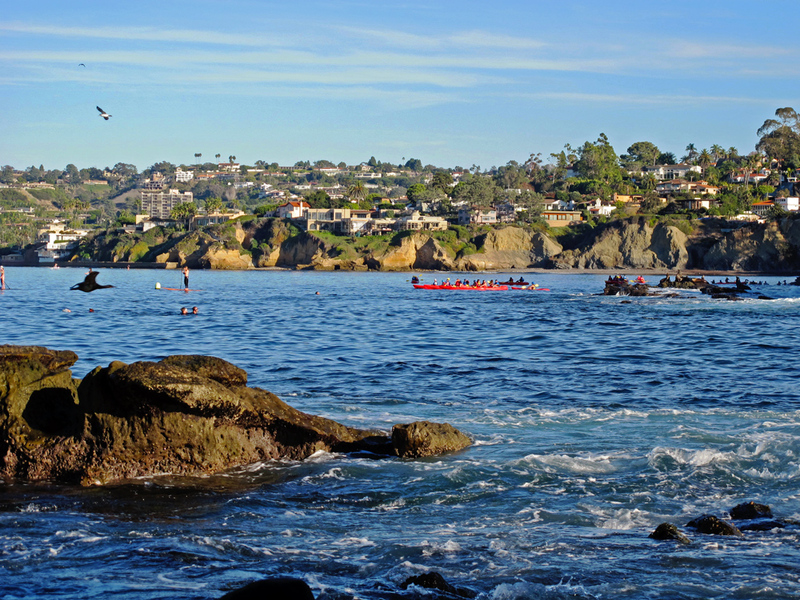 We went sea kayaking in La Jolla years ago and loved it. I remember kayaking right in to some of the caves. That’s so cool! My parents did it the sea cave kayaking too and raved about it. I haven’t gone…yet! That looks like a pretty great place! I love any chance to avoid crowds. It’s really pretty! If you’re in southern California, I definitely recommend a trip to La Jolla. Good to hear and see you had such a proper rest! The landscape is so amazing, but it looks like it was a bit windy there. I’ve never been there, but kayaking idea is great! It actually wasn’t windy, so it’s funny you should say that. Maybe it gets more wind than I realize, because the trees are bent! Thanks for sharing, it looks amazing there. My favourite seaside places are Bondi in Sydney for Fremantle here in the west. Both very laid back places. I hear Bondi is amazing, I can’t wait to finally go to Australia and see it. Fremantle I hadn’t heard of it, but after a quick Google Image search it looks fantastic as well. I find it hilarious to think that La Jolla could come from a misspelling of La Joya. ¡Vaya! (Or should I say “¡Valla!” or perhaps “¡Baya!”) Hehehe. Haha well based on my friends’ text-speak in Spanish, it’s certainly possible to spell things creatively! 🙂 I think quite a few place names must come out of misspellings, although I’m not convinced this is one of them because they definitely managed to spell a ton of things correctly in Spanish throughout California. So stunning! It’s exactly how I pictured the California coast minus the sea lions which I actually didn’t know lived in this part of the world. Definitely looks like the perfect place for a bit of relaxing and recharging the batteries. Yeah, La Jolla is pretty much straight out of a California beach postcard haha. The sea lions are just the cherry on top! They are such funny animals if you stay and watch them for a while. Looks beautiful! I have not been to the West Coast since I was very young and really need to spend some time exploring California (not Cali). The sea caves sound like a fun outdoor activity at a reasonable price. And the trip there would be worth it for the sunsets alone. Definitely! The West Coast is full of great stuff, especially if you like outdoors activities. This looks a fantastic place to visit, and I know the kids would love it too. The sea lion is gorgeous! We visited Monterrey many years ago and thought it was amazing. I fell in love with the otters! I bet your kids would have a fantastic time there! I used to go as a kid and loved it, because there is so much great stuff to explore. Monterey is another one of my favorite childhood places too. Did you guys see the aquarium? Awww – the sea lions! This looks like an awesome little getaway! Never been to the West Coast of the US yet. I’d love to explore some of those sea caves also. It’s a great little trip! Of course, San Diego has way more to do, but this is a good place for a quick side trip (it’s really close). You’re so lucky! I can’t wait until I eventually get to California.. Those Sea Lions are so cute eee. Ahh you have to make it to California someday! It’s one of my favorites (of course, I’m biased because I grew up there). 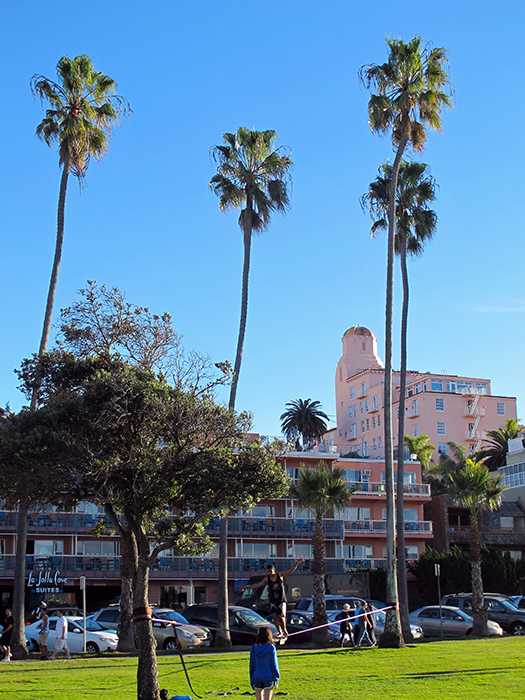 This is exactly what I think of when I picture California – the colour in the sky is wonderful, great photos! Thanks, Calli! It’s one of my favorite spots in California. I can’t wait to go back! Aaah cute little seals! That is the most perfect picture of a seal ever. I remember there being seals all over the coastline too up in northern California by San Francisco, Monterrey, and Carmel. Every time you were by the coast, you could almost guarantee a seal spotting. We took a family trip out there about 8 years ago and I remember Pier 39 down by Fisherman’s Wharf being so noisy with all the barking seals! We don’t really have seals on the East Coast, or at least not so much in the Long Island Sound which is the closest body of water to me (so not really the Atlantic Ocean). I always equate San Diego with San Diego Comic Con (mostly due to my job) but there’s obviously more to it than one single convention that takes place once a year. Haha thanks! I was a little obsessed with them. It’s so much fun to watch them! Jolla is clearly a misspelling of Joya (jewel) simple because Jolla is a word that doesn´t exist……the place must be beautiful to have been named thinking of a jewel……the issue with the letters “ll” and “y” is something that confuses many Spaniards because they sound the same….. that´s why many of us including myself, may have trouble with “haya” and “halla”, or “vaya” and “valla” for example. there are also many misspellings with other names in the USA, for example the famous woman´s name Dolores, you know, you see lots of Delores! quite funny it is! nice pictures by the way! Yes, when my friends text there are lots of those mistakes. Haha. But the other theory about “La Jolla” is that it’s a misspelling of a Native American word, instead of the Spanish word. Either way, somebody spelled something wrong! I haven’t met a Delores, but it looks very strange spelled that way. Woah Jessica, I love it. Nice pictures! Love the shot of the sea lions! I had absolutely no idea there was that much marine life/fauna. Really changes my perception of the state of the environment in that part of the States – from everything you hear on the news, its an urban jungle, but it’s great to know you can get away from it all. There is actually tons of stuff like this in California! A lot of the time, the big cities get all the attention, but the natural side of the state is absolutely breathtaking. L.A. may be an urban jungle, but even there you can definitely get away to nature pretty quickly. I want to make friends with a sea lion! They are super cute in a weird way- creepy teeth aside. Love your last photo of the sunset- stunning! All credit goes to the beautiful sunset! And yeah, sea lions are kind of weird but really cute and hilarious to watch. I’ve read quite a few posts on California now and it never fails to surprise me just how versatile the place is! Really need to go there soon! That’s a great way to describe California – versatile. It really does have a huge range of amazing stuff to visit. I love those sea lions but they do look rather noisy! And what a fabulous last photo – a great place to sit with a drink. Thanks, Karen! It’s a wonderful place to have a drink or a bite to eat. You should absolutely make a stop in somewhere in San Diego. I think it’s actually way nicer than Los Angeles, even though it’s not as famous worldwide. The beaches are gorgeous there! I remember those sea lions! I spent the whole summer of 2007 in San Diego and pretty often we went to La Jolla! It is really beautiful! Aw I would love to spend a summer in San Diego! If I move back to California, I think it’ll be to San Diego, I really like it there. Definitely! California has so many more great things than the stereotypical stuff that gets shown a lot. Don’t get me wrong, that stuff is nice too, but there’s a lot more to the state than it. Thanks so much, Natasha! I don’t usually participate in award stuff, but thank you very much. 🙂 I’ll click on over to read your post right now. LOVE La Jolla! Another favorite would be Laguna Beach! I went to university down there, so I enjoyed lots of beach days! 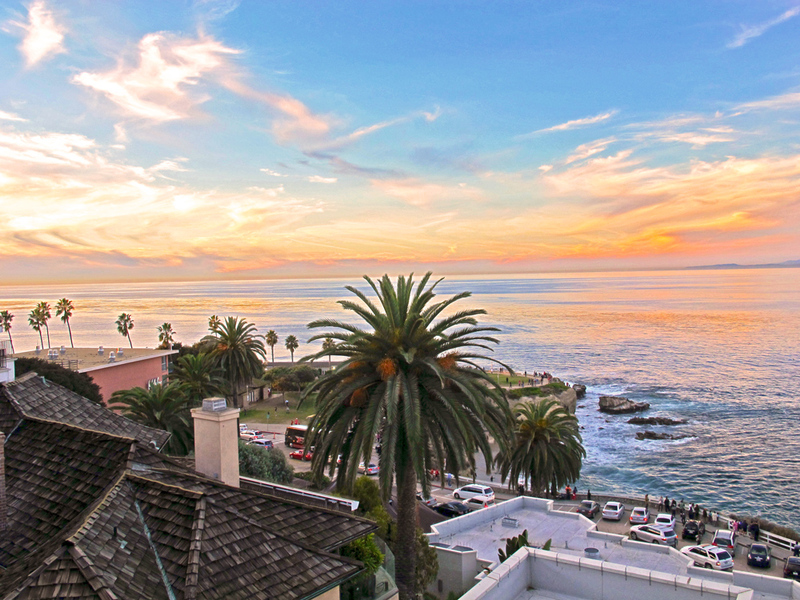 Ah Laguna is gorgeous too! Going to school by the beach must have been awesome. Love this! The sea kayaking pretty much sold it for me, I would love to try it (hopefully I will, soon!) I also love the amazing views and the fact you can see sea lions… and slacklining, so cool! Yeah, there is tons of great stuff to do here! I would love to try sea kayaking sometime too. I did it once somewhere in Orange County but not in the open sea like this. 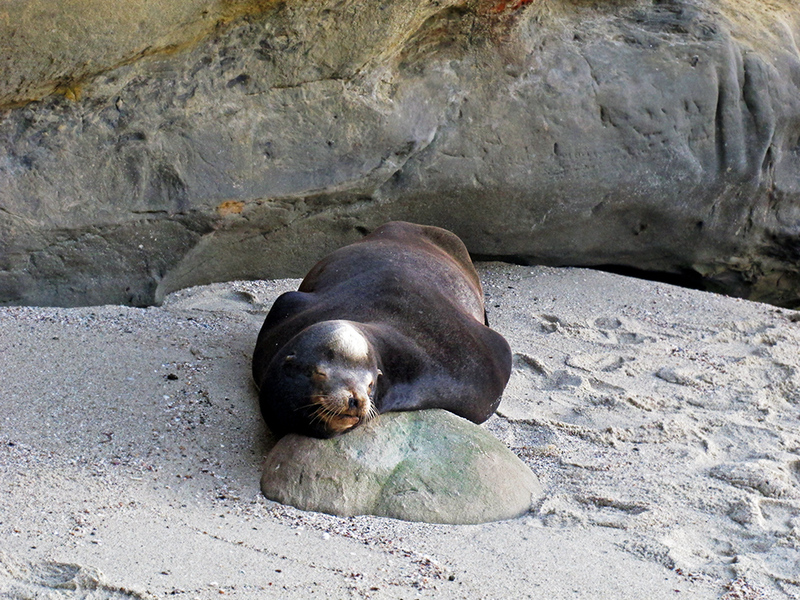 Looks like a great place to relax, just don’t fall asleep too close to those sea lions! Haha I’m not sure what they’d do if you did fall asleep near them! Probably not much if you didn’t move; they seemed pretty used to people. Great photos! 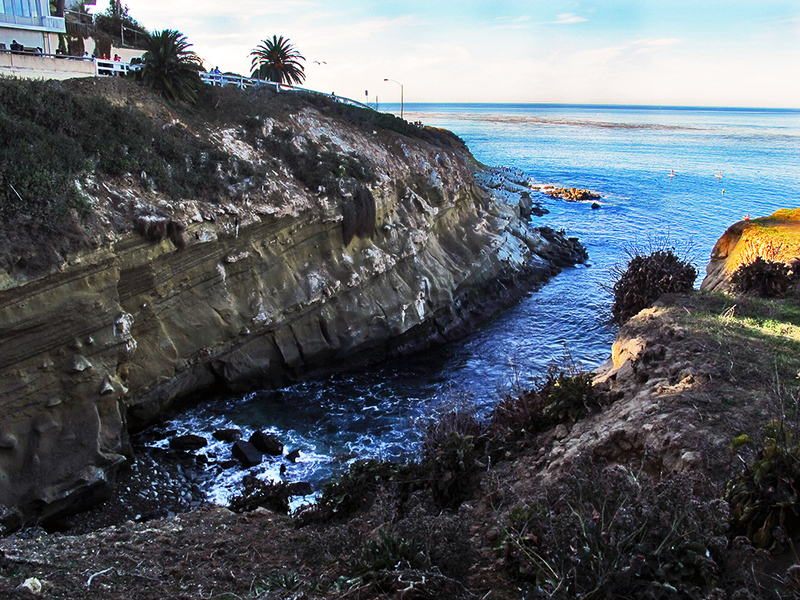 I love La Jolla – such a beautiful town and so relaxed. I love to just sit around sidewalk at cafes and soak in the views. Thanks, Amy! I’m a big fan of La Jolla too, it’s such a nice, relaxing place. I’ve been to San Diego, but not La Jolla (yet). I’m actually going back down to Southern California in a couple of days and maybe this time, I’ll get to check it out! I’ve heard nothing but good things about it, so I’m sure I’d like it, too. Personally, I like Santa Barbara, although it’s a little too quiet for me to want to live in right now. I also really like Dana Point simply for being ridiculously pretty to look at. Oh cool! There is so much great stuff to do in southern California, but La Jolla is one of my favorite spots. There are also some nice wineries out in Temecula! I like Santa Barbara as well, although it is really laid-back. I was so close to going to UCSB for college because I liked the beaches up there so much. 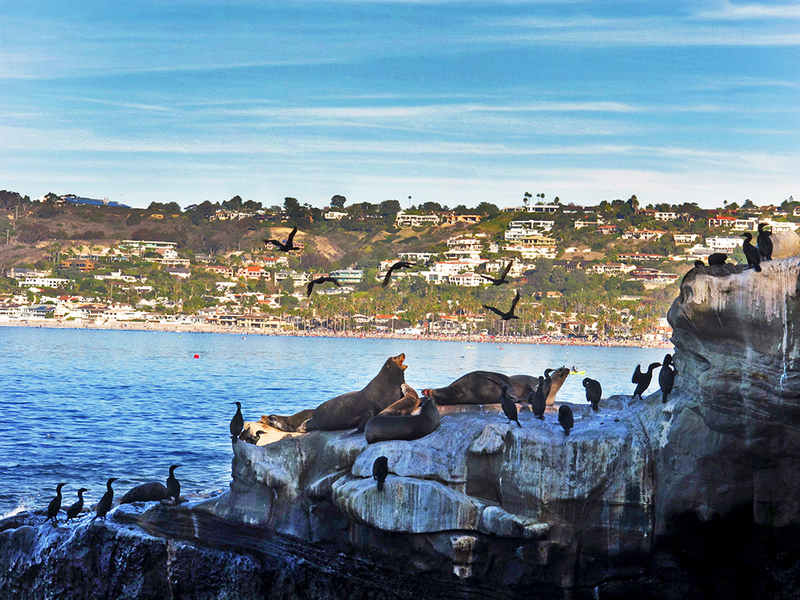 Oooh…love La Jolla. I actually lived on campus at UC San Diego, but surprisingly didn’t spend a lot of time outside of the university confines. How sad is that?! Every time I go back, it feels so breezy…unreal, like nobody’s really working there, just kicking back. Oh, the seals used to have tons of sandy space to lay out, then some years ago, they opened the area to tourists, so the seals were just treading water all day until the tourists went home. It was so sad!!! Looks like they have more space now? Hope so! It was really heartbreaking. It seems like they have a pretty good amount of space, but they steered clear of the beach while people were there, of course. Hopefully it’s enough for them. The sunsets look very beautiful here. To be honest have not heard of the area but we are off to California in the next few weeks – might have to check it out. I have to make it to Southern California again ASAP. I can’t wait to see sea lions basking in the sun. I’ve lived in LA briefly, but I’ve never been to La Jolla. Ohh you should definitely go further south down the coast – there are some amazing beaches. L.A. beaches are nice, but Orange County and San Diego (where La Jolla is) have even prettier ones! La Jolla is one of my favorite places to visit. I live in Palm Springs and I make a trip once a month there and enjoy the ocean area.